Chinese-made children shoes carrying a Chinese map and U.S. flags are on display for a sale at a shop in Beijing, July 13, 2018. 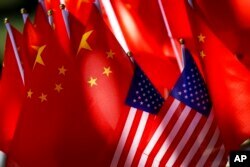 China says it is impossible to hold trade talks with the United States with a new round of tariffs in place. U.S. imposed duties on $200 billion worth of Chinese goods, and a retaliatory set of tariffs imposed by Beijing on $60 billion worth of U.S. goods, took effect on Monday. Chinese vice commerce minister Wang Shouwen asked reporters in Beijing Tuesday how can any talks proceed now that the Trump administration has adopted such "large-scale restrictions," which he said is like "holding a knife to someone's throat." Wang led a Chinese delegation to Washington for the last round of talks between the two sides in August. The new U.S. duties covers thousands of Chinese-made products, including including electronics, food, tools and housewares. The new tariffs begin at 10 percent, then will rise to 25 percent on January 1, 2019. Among the items included in the new Chinese tariffs on U.S. products are liquefied natural gas. American flags are displayed together with Chinese flags on top of a trishaw in Beijing, Sept. 16, 2018. The U.S. has already imposed tariffs on $50 billion worth of Chinese goods, and China has retaliated on an equal amount on U.S. goods. And President Donald Trump has threatened even more tariffs on Chinese goods — another $267 billion worth of duties that would cover virtually all the goods China imports to the United States. Economic forecasters say the trade spat between the world's two biggest economies could slow the global economy through 2020.